← Did You Hear the News About AntiquityNOW? The Seahawks and Patriots are playing in the National Football League’s Super Bowl XLIX in the United States this Sunday. There’s lots of planning to do before you throw the Super Bowl party of the century. You’re probably stocking up on chips, dip and of course beer, but maybe this year you should consider serving your guests a different libation. We’re bringing you a simple recipe that features what is believed to be the first alcoholic beverage: mead. Surprise your fellow fans with this ancient drink and impress them with a bit of history behind its main ingredient. And just in case you want to prepare for next year’s big game, we’re also providing an easy and delicious recipe for making your own mead. Get started early, though. It takes about six months to mature. Mead, at its most basic, is a fermented drink of honey and water; however, there are variations that include fruits, spices, grains and hops. It has been suggested that the drink was most likely discovered by prehistoric hunter-gatherer societies when they happened upon upturned beehives that had filled with rainwater. The honey and water had fermented over time and when the ancients drank it, they were treated to the world’s first alcoholic beverage. Some form of this discovery most likely occurred in many different places all over the ancient world since we have widespread writings about mead from numerous cultures. Ancient Greeks– It was called ambrosia or nectar and was the drink of the gods. It was believed to “prolong life, and bestow health, strength, virility, re-creative powers, wit and poetry.”It was often used in religious ceremonies by prophets to induce an intoxicated state in which they could commune with the gods and divine the future. Ancient Celts– Mead was used in religious rituals and was thought to possess magical properties that could heal and even make one more fertile. Celtic mythology includes a river of mead that runs through Paradise. Ancient Norse– Integral to Norse mythology, mead was the drink of the gods and was offered to heroes upon arrival in Valhalla. It is said to have originally been made from the blood of Kvasir, a man created by the gods and the “wisest human that ever lived.” Kvasir was killed by Fjalar and Galar, who drained his blood and mixed it with honey producing the Mead of Poetry, imbuing knowledge of all things. Because of this origin, it inspired poetry in the drinker. Ancient Anglo-Saxons– As with other ancient cultures, Anglo-Saxons used mead in religious ritual and ceremonies. The word “honeymoon” comes to us from the tradition in which a bride and groom would drink the mead during the month following their wedding. It was thought to serve as an aphrodisiac and as well promote fertility. Several hundred years ago, mead-making declined sharply all over the world. People began to prefer wine and beer. 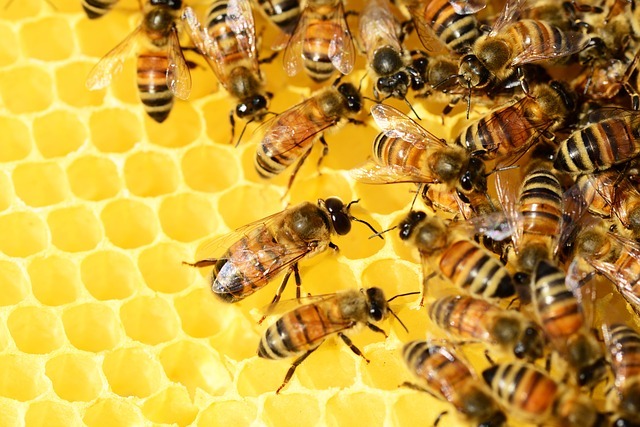 Also, with the spread of sugar as a sweetener, honey was less in demand. 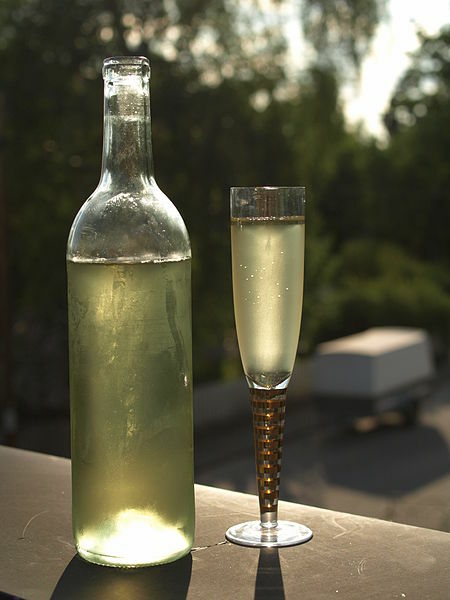 However, in recent years mead has made a comeback, especially in the United States where numerous meaderies have opened up all across the country. More and more people are trying this ancient drink and delighting in the many varieties that can be produced. So, this Sunday, as you watch the Seahawks and the Patriots fight for the greatest prize in the NFL, fill your flagon with a delicious mead cocktail. And don’t forget to start preparing your own mead for next year’s game! Serve over ice, preferably in a rocks glass. **If you would like to add a bit of spice to this recipe you could add 1 or 2 cloves. But be careful, they are very strong so don’t put more than 2. Pour about half of the water into a clean container. 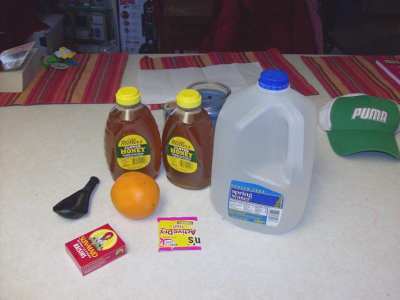 Slice up your orange into eighths and put the slices, honey, twenty-five raisins and the yeast into the now half-empty water jug. Pour some of the water back into the jug so that the level is a couple of inches from the top. Put the cap on and shake it up well. If you can, you should shake it for a good five minutes. This will aerate the mixture. The yeast needs a lot of oxygen to grow vigorously. Poke a pinhole in the top of the balloon, remove the cap from your jug and put the balloon right over the mouth of the jug. The mouth of the balloon should be stretched completely over the mouth of the jug so that as the gases form inside the jug they will inflate the balloon. Put a rubber band or tape around the neck to keep it firmly in place if it feels like it might come off. Leave it out on a counter for the first day so you can monitor it. *Check the balloon regularly for cracks or degradation caused by oxidation and replace it if it shows any signs of either. Somewhere between an hour and twenty-four hours later the balloon will start to inflate. This is a great sign and it means that your yeast is transforming the contents of the jug into wine. Gases are forming inside the jug and are escaping through the pinhole. This setup insures gases escape but no contaminants get into your brew. If the balloon is getting big you may need to poke another hole or two in it. You don’t want it to burst. It would leave your mead open to contamination. Once you are satisfied that the gases are escaping and the balloon is not under unusual stress you can set the jug in a cool dry place like a kitchen cabinet or closet shelf. Check on it every day if you can just to make sure it is ok and the balloon hasn’t popped off. After two to three weeks the major portion of the fermentation will be complete and the balloon will have deflated. At this point you may want to taste a little bit to see how it is coming along, but it isn’t really a tasty wine at this point. It will need another couple of months to begin tasting delicious. Over time, as you check on it, you will notice the cloudiness disappears and it slowly clarifies and transforms into wine. The orange and raisins can stay in the mixture for the entire process, but if you want to make the mead a little milder and help it clarify faster, you can transfer just the liquid, minus the orange and raisins, into another gallon jug and place the balloon on that one. This would be after the two to three week fermentation period is complete. This process is called racking and it will move your mead along nicely. Be patient and taste your mead every few weeks. It should be really clear and delicious after a few months. It will continue to age and improve over time so the longer you wait the better it will get. Try to wait six months if you can! You can experiment with the flavor a bit by adding a cinnamon stick or a pinch of nutmeg to the batch when you add the orange. Don’t leave out the raisins. They are not there for taste. They are a necessary food for the yeast because honey is a bit low in the nutrients that yeast likes. Make sure you sanitize everything that will come in contact with your mead. When mixing up your honey, water and other things you are making a food environment. It is a place loaded with nutrients for yeast and that means it can be easy for other types of unwanted yeast or bacteria to quickly grow! It’s almost like a little incubator. You want to make sure no outside yeast or cells develop other than the yeast you pitch. This means you should sanitize everything that comes in contact with your new batch of mead including the jug, spoons and measuring cups. Beran, M. (2014, July 28). What Is Mead? Retrieved January 26, 2015. This entry was posted in Blog, Bon Appetit Wednesday, Culinary, Culture, Public Life, Religion and tagged ancient fermentation, ancient history, ancient honey, ancient recipes, AntiquityNOW, Bon Appetit Wednesday, mead, nectar of the gods. Bookmark the permalink.